This area is about 3 km south of Djoser's step pyramid. The area is further subdivided into three pyramid clusters. The pyramids Pepi I (6th dynasty), Djedkare-Isesi (5th dynasty) and Merenre (6th dynasty). These are located on the north side of South Saqqara. The pyramids of Ibi (8th dynasty), Pepi II (6th dynasty) and the mastaba of Shepseskaf (4th dynasty) which are located in central sector of South Saqqara. About 1km south of Pepi II's pyramid are the pyramids of Khendjer and the so called Unfinished Pyramid, both 13th dynasty. The area is difficult to reach. The most practical approach is through the village of Saqqara but finding the spot on the edge of the desert requires a knowledgeable taxi driver. A track through the desert would require a 2 hour walk through the soft sand from the step pyramid. 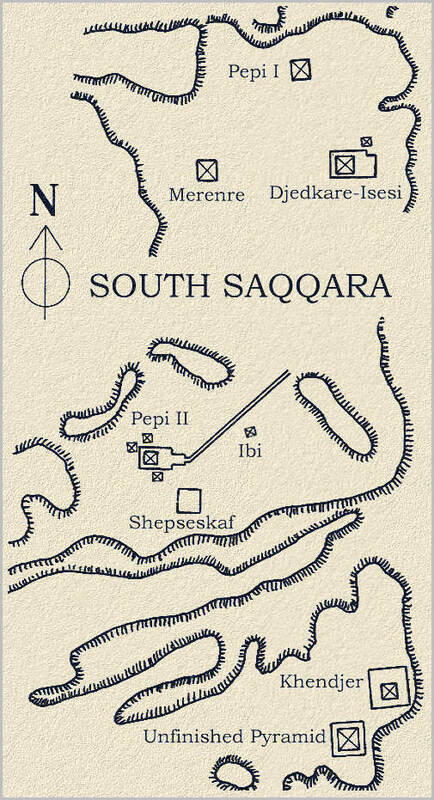 South Saqqara is in fact a 6th dynasty necropolis. Pepi II ruled the Two Lands for some 92 years, the longest in Egyptian history. The end of his reign represents the fall of the Old Kingdom. Located next to Pepi II's pyramid is the giant mastaba of the 4th dynasty ruler Shepseskaf. He was the last king of the majestic 4th dynasty.